First calving heifer not letting milk down - Please Help! Nearly 4 weeks ago we had a 3 year old very good condition (on a rate of 1-5 she is 7) Angus/Kiwi Cross heifer named Comfrey calve. She won't let her milk down for us, and it is getting to the point that we are wondering what to do. Well, on January 19th, she gave birth to a beautiful bull calf (Diapason) that has been healthy to this day. We milked her that day, and as she had just calved, the milk was easy flowing. We also noticed right away that she had a severe problem with kicking. But now, 4 weeks later, even though we milk her twice daily, wash her udder and teats with hot water, hold hot cloths on her udder, feed her molasses, magnesium, a multi mineral mix and garlic (garlic for a teat infection that has cleared up), and give her lots of love, pears, hay, (as we have low grass), water, attention, and just about everything we can think of to help her, she will only give 1-5 cups (5 being the most this week) of milk on one side, and hardly 3 strips per teat on the other side (her calf's side)! Her udder is also the same size as it was 4 weeks ago when she calved, and there has been little improvement. It is not edema. For the last week or so we have been separating her with her calf and 1 other (Bellow) that was born a week before hers so that we can milk his mother (Flossie), which we do by hand. Then seeing as Comfrey accepted Bellow, and a R3 Jersey heifer (Buttercup) had calved, after the new calf (Violet) was about 2 weeks old, we put her in with Comfrey, Diapason and Bellow over night, then milked Flossie and Buttercup in the morning, and gave them the calves back. Bellow has frequently been spotted feeding off Comfrey. We have been aware of this problem from day one, and have been working with it to the best of our ability. We have been searching books and the internet to find natural ways to encourage her to let down her milk. It has been incredibly busy around here with 3 heifers calving within 3 weeks, and coping with exhaustion with everything else that is going on too! We would be extremely grateful for any input! We would like to do this as naturally as possible. Why don't you just leave all three calves with her and milk the other two? That would be easiest. The only other thing I can offer is to use oxytocin to for c e her to let down. But I think using her as a nurse cow would be better. Have you tried bringing her calf in when you milk to get the calf to get her started? You would need to separate for at least a few hours first to make sure the calf was hungry. This is what I had to do with my first cow, I needed the calf to jump start her and needed to bring the calf back about half way through milking to keep things going. I supervised to make sure the calf only nursed on "her teat" keeping the other three clean. So you are putting other calves in with her at night? She is letting them nurse. There is nothing you can do to stop her from letting other calves nurse except separation. If she is good at holding up, you will have to milk her while her calf nurses. Not only are you not separating her from her calf before milking, you are putting 2 other nursing calves in with her so you can milk their mothers? I am surprised you get any milk out of her at all! Put all 3 calves in their own separation pens overnight . Then either try milking her when she is full or let her calf in to nurse while you milk to get a let down. That is what I would try. Well, help with the understanding of let down and what factors encourage (and what factors discourage) it. If she doesn't have any milk at milking time it obviously won't help. 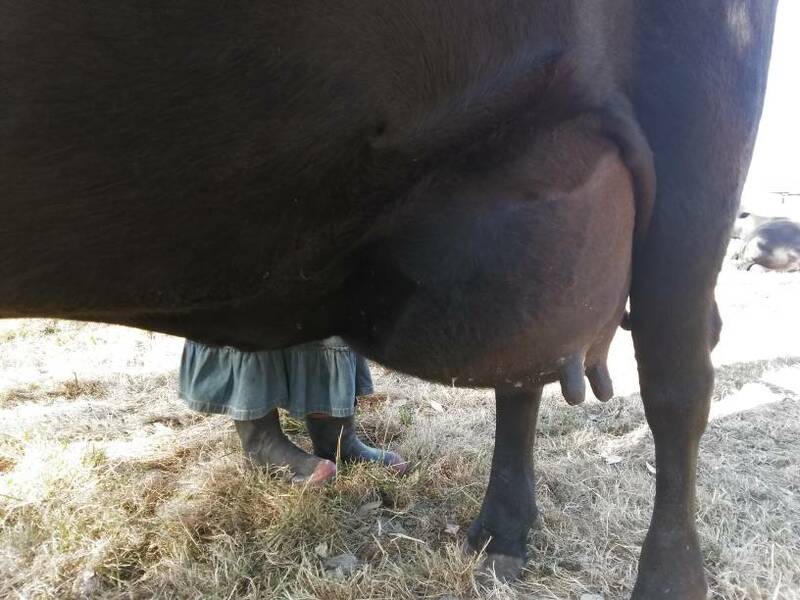 One thing I noticed in your description is that you hold the hot clothes to her udder - I assume as part of the prep. It is hard to get a cow milked out within a few minutes of the start of the stimulation even without taking time to do that. I agree she probably doesn't have edema now - is there another reason for doing that? When a cow first calves, she may not hold up her milk. As she gets back to her normal routine, especially if she has a calf nursing on her, she recognizes who she wants to give her milk to (her calf) and gradually holds up more and more from the humans. This is why most dairies separate the calf at birth. You'll have to try to trick the cow, there's lots to read on here about share-milking how to get around the normal problems. You got lots of good advice already, with plenty of links to read. I just wanted to say, "Howdy from West Texas", and welcome to the forum! Good luck getting your three heifers/three calves sorted out! That's a lot to deal with at one time!!! Thanks for the great tip sunburst4! From that evening until this morning we have had all 3 calves with her, and have only milked the other 2 cows, and it has worked really well. We are still concerned as her udder is holding the same shape even though she has had the 3 calves on her. I may get her in the stantion to check her out tonight. We knew about the oxytocin, but hoped we could do it without if possible. Thankfully she has a very motherly nature, and has been very accommodating! Hi karenp, Thanks for that advice! The other day I milked her in the paddock on one side with her calf feeding on the other side, then when he swapped around, I did, too! I ended up getting about 2.5-3L that milking!!! A record I was excited about! We haven't separated her from any calves (except accidently twice! And the second time her calf broke out before we reached her) as we were afraid of causing further problems with her udder which has never changed even with all 3 calves on her. With our first milking cow 3 years ago we would put the calf on a couple times to get Molly to let the milk down. When the calves grew older (and stronger!) we found it a challenge to put an end to the practice, but decided (if possible) not to do it with any other cows!!! Hey simplynaturalfarm! We are putting them in with her at night, and she is letting them nurse. Comfrey's calf is 4 weeks old today, so should be keeping her empty! But he would have a lot of milk to keep on top of! When we separated her from her calf (by accident) she didn't give much milk then, either. We don't mind the other calves nursing, but our concern is her udder which is big and hard, but not hot. I will try to upload a photo sometime. Hi saysfaa, Thank you very much for that helpful link! It does help to know the science! The hot cloths are a part of the prep - washing her so she is clean for milking. I also was holding them on longer, and re-heating them from my bucket, plus massaging and brushing her udder so she would hopefully relax and let the milk down. Followed by a really good scrub with a dry cloth to dry her off. Yesterday one of the cows needed a second wash in the stantion, but the water had cooled down. Even so, she let down a lot more milk! Hi there rosalind! Thank you for that! We have been getting a lot of helpful information off your website (and this one), and that was the first place we looked when our second cow to calve calved on our farm (learning about the pins! ), and also the first place we went when we encountered this problem! The photos of the udder development were also very helpful as our heifers neared their due dates! We have watched quite a few of your videos as well, and found them very good! Our cow is very clever! We have tried to punch her let-down buttons (also found where they are on your web!!! ), but that results in an atrocious kick! So I have left that part alone. I will see if I can upload some photos so you can see what her udder looks like. Thanks again!!! I really appreciate your help!!! Howdy westxgrl13! I sure have got a lot of good advice! Thank you for your warm welcome! We have been coming here for years for problems with our animals... For example... About 3 years ago, one of our (close to calving now!) young heifers got bloat, so I came over here, and wound up with a good amount of information that saved her life! We then used that same information to save our lamb that also bloated a while later! ~As a last resort, you can jab with a needle or knife. Watch out, though, for stuff flying out! Yes, we have had our hands full with all those animals! We are finally getting into a routine, which means we don't have to feel like we are milking all day!!! We have another 3 or so due to calve soon, so things are likely to change in the next little while again!!! Here is a picture of Comfrey's udder today. There doesn't seem like much change since she calved 4 weeks ago, even after the calves have been feeding. Any thoughts? Hope this helps to explain our situation! Here's the pic from the link valiantfarmer posted above. Her udder can't change shape even when empty. It looks like her medial suspensary ligament is ruptured or really stretched out. That is why her teats point outwards rather than downwards. Hi there AmyP, Thank you for uploading that! And thank you also for the diagnosis! That is a HUGE help!!! Is it something that we can look after ourselves? We really appreciate your help! Thank you so much!!! The damage is already done. It won't heal and will possibly get worse each calving. It is hard to empty such an udder with hand or machine milking, but since you have the calves on her she will likely get emptied better. "Blown" udders like that are more prone to mastitis. You'll have to figure out what works best for your farm, I would keep her as a nurse cow and keep an eye out for mastitis problems. If she gets mastitis/ develops an attitude problem/won't breed/etc, I would beef her. Yikes that is one sad udder - poor girl! I would be prepared to cull her and only use her for nurse cow, not keeping heifers out of her.